It’s been more than a year since I started this blog.. Last year, in this month, I was so dull and unexcited but this year, I’m super energetic.. I hope you are happy in your lives like me and have a great month ahead.. So it’s kind of a ritual I follow where I share what my year planner tells me with you all.. It really motivates me and helps setting goals! Lets see what it has to teach me this month.. I completely agree with it and it has a clear yet really meaningful message. If we keep people happy, they will let us be happy. What can you think of when you read this quote? The other thing which my planner says is, “One must follow three Rs: Respect for Self, Respect for Others and Responsibility for all your Actions“.. I actually loved this quote even more. It has so much to say.. My parents have always taught me to respect myself, my body, my spirit and my mind never forgetting to do the same with others.. If we can’t respect ourselves, we cannot extend ourselves to meet the needs of others.. Its such an intense topic that I can talk about it for hours.. As for responsibility, I support this phrase strongly. We are definitely responsible for what we do, what we speak, how we behave. Everything that exists in our life exists because of us and our actions. I know I am getting really indepth and this is not a motivational speech or a lecture but I think you are the ones I can pour my heart out to.. Even though I respect myself and everyone as much as possible but I gotta be more careful and more respectful now. I am responsible for what I am doing and what I am sharing on this platform. Do you agree with what my planner says and what my thoughts are? What do you think of them? How important is self respect for you? Do let me know in the comments below.. Happy June 2017 My Loves! 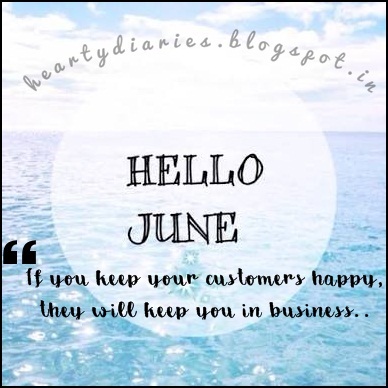 I hope you all have a wonderful month ahead!